For seven weeks, Ashley Burkett lived and worked on a floating laboratory far above where two tectonic plates collide under the Pacific Ocean. The research ship JOIDES (Joint Oceanographic Institutions for Deep Earth Sampling) Resolution allowed Burkett and other scientists from around the globe to drill about 1,000 meters below the ocean's floor and pull up samples to learn more about the area where one plate dives beneath another and creates earthquakes. "Scientists on board were really interested in looking at plate dynamics, causes of earthquakes in the region and how seafloor erosion is affecting the generation of earthquakes," said the Indiana State University doctoral student in spatial and earth sciences. 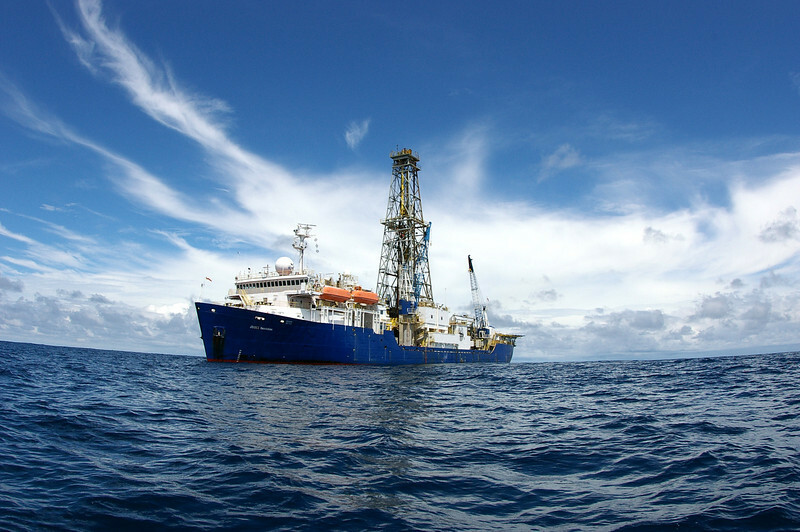 In the fall, Burkett, who completed her master's degree at ISU in 2011, participated in the Integrated Ocean Drilling Program (IODP), which is a consortium of international scientists working together on one project. Burkett represented the United States in micropaleontology by examining samples for benthic foraminifera, a single-celled, shelled organism that provides insight into the history of environmental change. "It's quite an honor to be chosen to represent the United States on this international cruise," said Tony Rathburn, Indiana State professor of geology and Burkett's advisor. "They had other options and yet they chose her over more experienced people because they had confidence, not only in her, but in her training and experience here." For Burkett, the experience proved to be one more link in a long chain of research experiences that has included a deep sea dive in the Alvin submersible off the coast of Costa Rica, two expeditions off the coast of Australia, three research cruises off of the California and Oregon coasts and research at the Natural History Museum in London. She also has been invited to speak at an international conference in Germany. "Being here at ISU has provided me with experiential learning and many first-hand opportunities to go out there and collect samples, but then also to rub elbows with other researchers," she said. "The number of opportunities for Ashley and others has grown and I think one of the reasons for that is that this kind of thing just snowballs," Rathburn said. 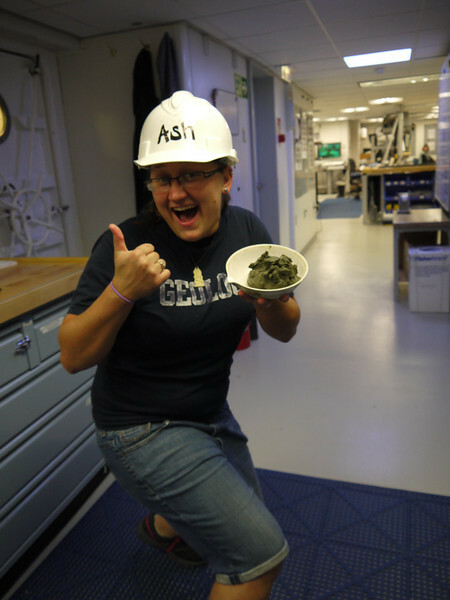 "I think that is very evident in Ashley's record and this IODP expedition will likely lead to additional opportunities for her and add more icing on the cake." During the weeks of the IODP cruise, in which the scientists could often see Costa Rica's coast from the ship, Burkett worked in 12-hour shifts from noon to midnight, alternating with other foraminifera researchers from Japan and Spain. When the drilling rig on the ship pulled up the core samples, "scientists would run to the table and take a first look at things and say, ‘Oh, this is interesting,'" Burkett said. "We divvy up the sampling and the responsibilities of things." Some of the 34 scientists onboard looked at sediments, others looked at the magnetic grains within the core while geochemists investigated the core's water chemistry. "Then there is my group, which is the micro-paleontologist. We look at the micro-fossils that are in the sediment cores and we can tell things about the environment and/or about the time period based off the micro-fossils we find in the core," Burkett said. "If you're not at the microscope then you are writing up your results. If you're not doing that, they you are researching and trying to make the basic interpretations that you can because it's a real delicate balance between ‘what do I have time for' and ‘what is the best job I can possibly do' because these data are dispersed on a global scale." While working with Rathburn, Burkett has examined living foraminifera. However, with the IODP, she followed the fossil trail back to the Miocene Period. "I just looked at it as an opportunity to use my research results as modern analogs and apply them to a realm in paleoceanography that I had no real previous exposure to," she said. Burkett's diverse training and opportunities come as part of Rathburn's teaching philosophy. "The training program that I use in the lab and in the field is designed to increase confidence, to give folks hands-on experience and to get them up the next level," he said. "He treats undergraduates as graduate students. He treats graduate students at a higher level so master's, he treats as Ph.D. students and Ph.D. students, he treats as post-docs," Burkett said. As a doctoral student, Rathburn's approach means Burkett maintains the laboratory, mentors students and teaches a class. "I want to go into academia so the ability to teach a class here at ISU is kind of unique because that is not really required for most Ph.D. programs," she said. While Burkett has worked as a teaching assistant, this spring she is teaching her first class. Excited about crafting the class' lessons, Burkett also felt nervous about the possibility of the students asking questions that she couldn't answer. "I have really enlarged my scope of basic knowledge going into that class by making sure I study all the different aspects of the topic so when they ask a question I can answer it," she said. From teaching to research, Burkett said she has had multiple opportunities because of Indiana State. "There aren't a lot of programs where graduate students are as exposed to some of these things as they are here, which is something really great about this department and ISU," she said. 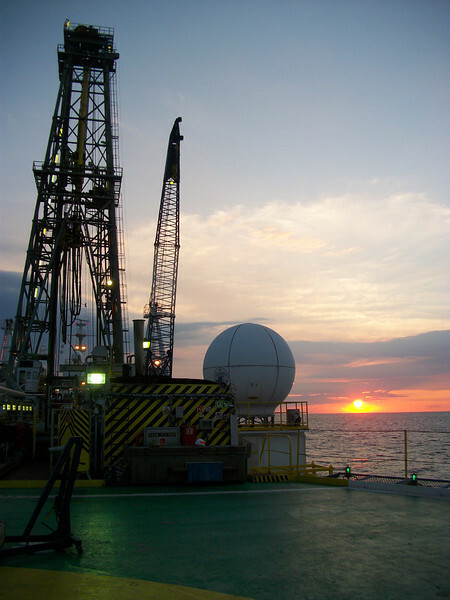 Ashley Burkett spent seven weeks aboard JOIDES Resolution as part of the Integrated Ocean Drilling Program.